While in Malaysia last year, Selena and I came across this rad seal carver and had seals made. 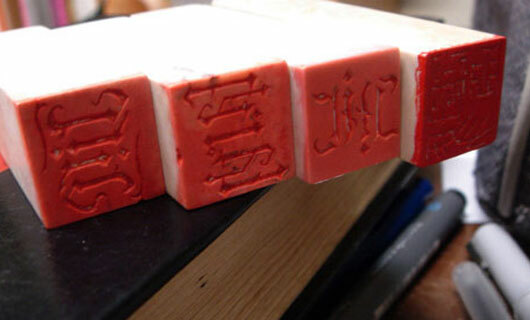 I have an affinity for hanko carvers because they create work in relief and in reverse, like the punchcutters of yore. Much radder to see it done by hand than by a guy doing it on a computer (which is the norm for low-rent seal shops in Asia). If you are ever in Malacca (which is the awesomest city in Asia in my book), hit up King. Read all about it over at PingMag. It is Malaysia’s arts capitol, and is just a beautiful port city full of wonderful old architecture and giant lizards. Cheap and the food is bananas, as well!